Paw Patrol is a popular TV program on Nickelodeon that follows 6 rescue dogs who are lead by a tech-savy kid, Ryder to protect their community. 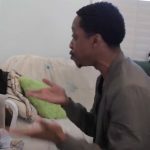 Each dog has a special skill or gadget that helps them to do jobs like rescuing a cat or saving a train from a rockslide. 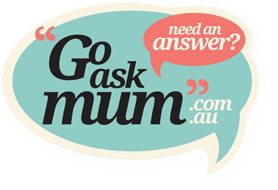 This party theme is great for unisex parties and the show appeals to kids of all ages. 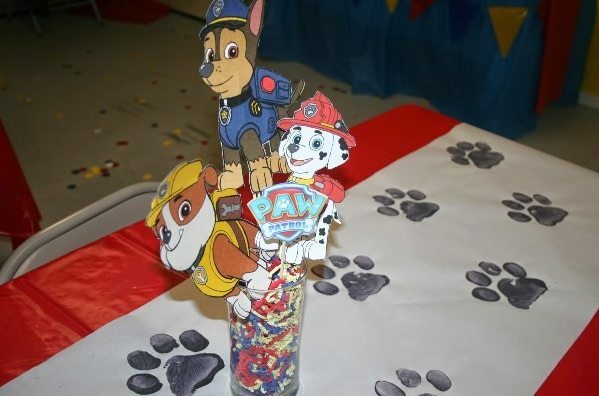 To create the ultimate Paw Patrol Party, why not incorporate some ideas from this post and our Mr Peabody and Sherman Party Ideas? 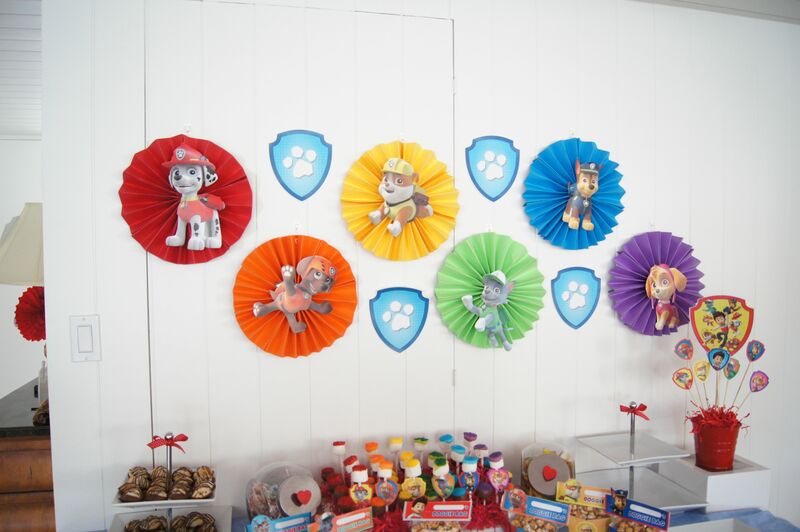 This free printable Paw Patrol Party Banner can be printed and erected behind the party table. 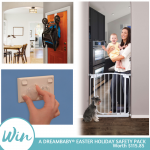 Click through for your free printable here. Use dog bowls to serve the food. 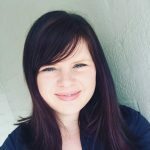 Dog bowls can be purchased from discount stores. Decorate each bowl with bone stickers for a fun play on the theme. Choose a scenery backdrop for the food table. 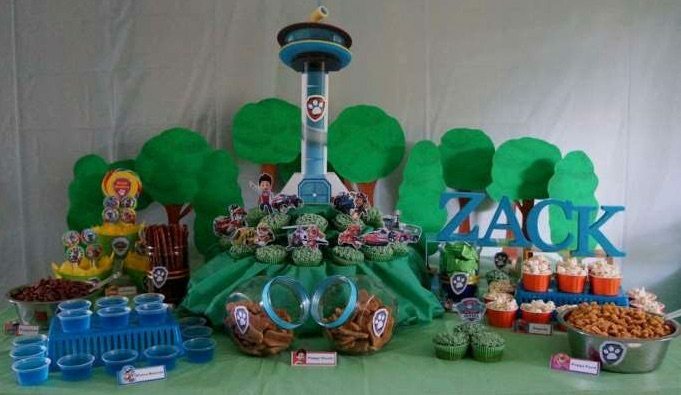 This party has been cleverly decorated by adding character cupcake toppers to cupcakes decorated with green icing. The scene looks like the set from the TV show. 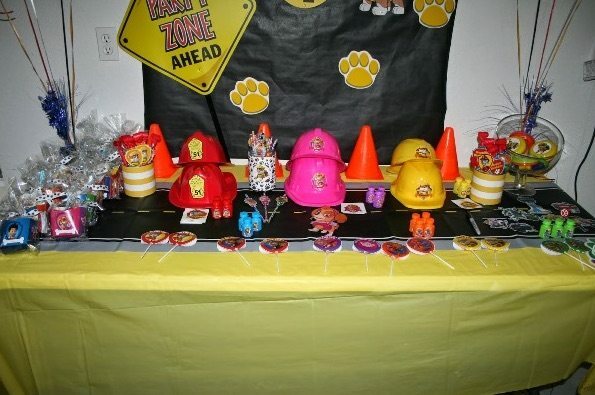 A party favour zone is a great way for kids to immerse themselves in all things Paw Patrol related. 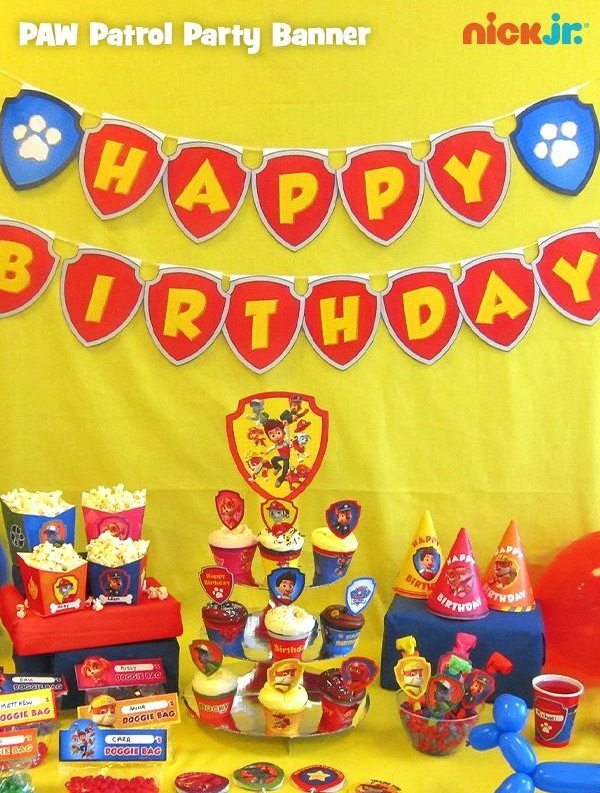 Safety Helmets, Witches Hats and signs are just a few of the options available for kids to create their own Paw Patrol Party favour experience. For a colourful take on the Paw Patrol theme, use fanned lanterns to feature each dog colour to make a fun backdrop to the food table. Paint paw prints on a roll of butcher’s paper to use as a table runner for the eating tables. 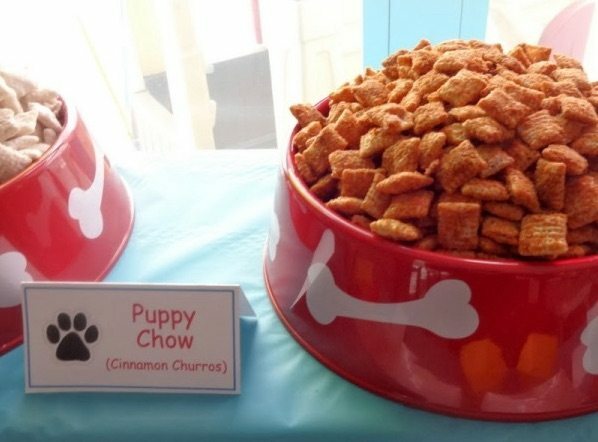 Puppy Chow can be dog bowls offering chips or savoury snacks. 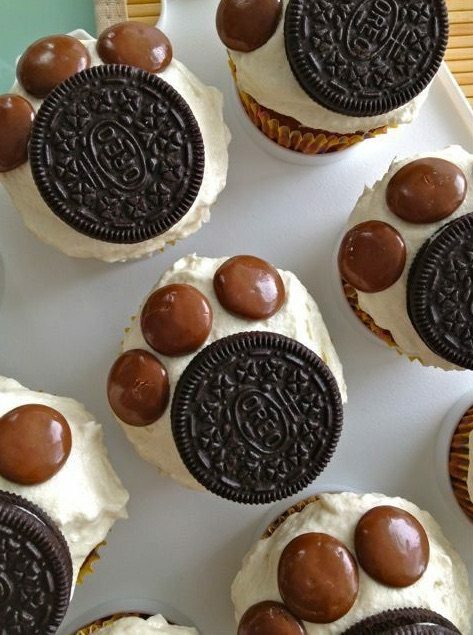 These cupcakes are easy to assemble using oreos and chocolate drops. 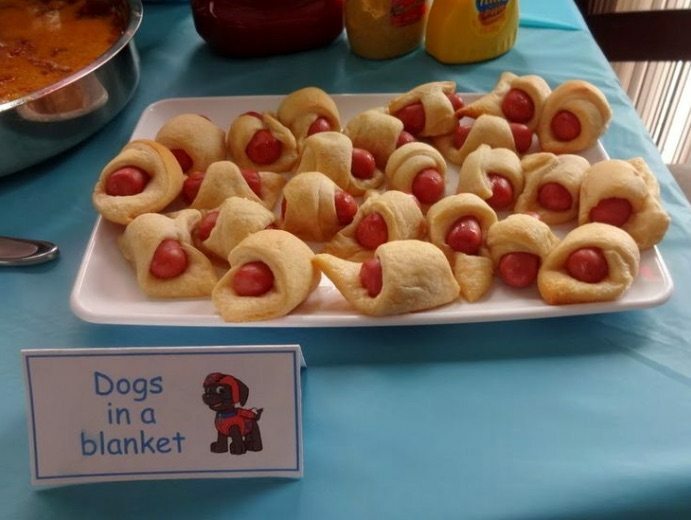 Dogs in a blanket are an easy savoury food for kids to eat. Wrap cheerios or mini frankfurts in pastry and bake in the oven. Use a dog bone cookie cutter to cut cheese and ham shapes. 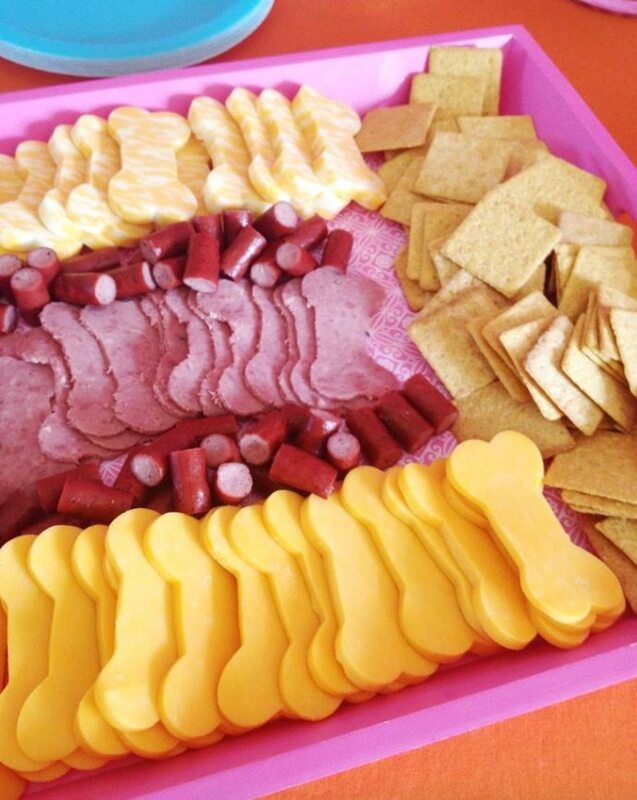 Add savoury biscuits and salami sticks for a delightful platter display. Doggie bags make great party favours. 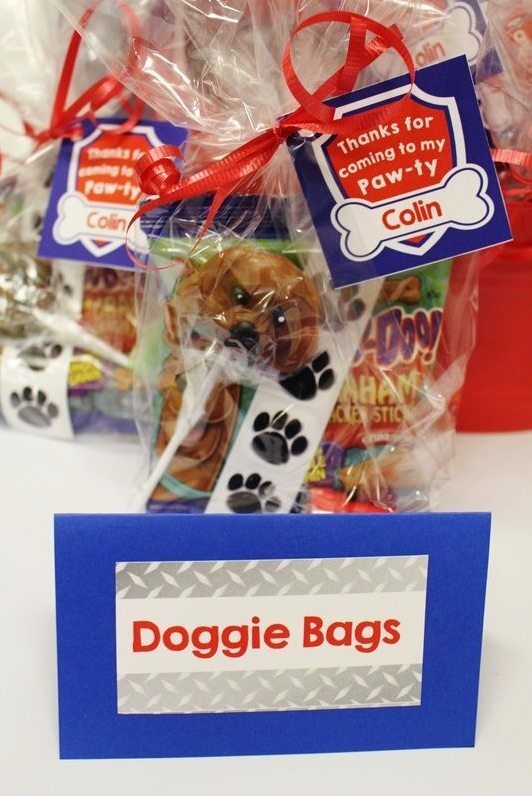 Add a tag to each bag telling each guest ‘Thanks for coming to my Paw-ty’. 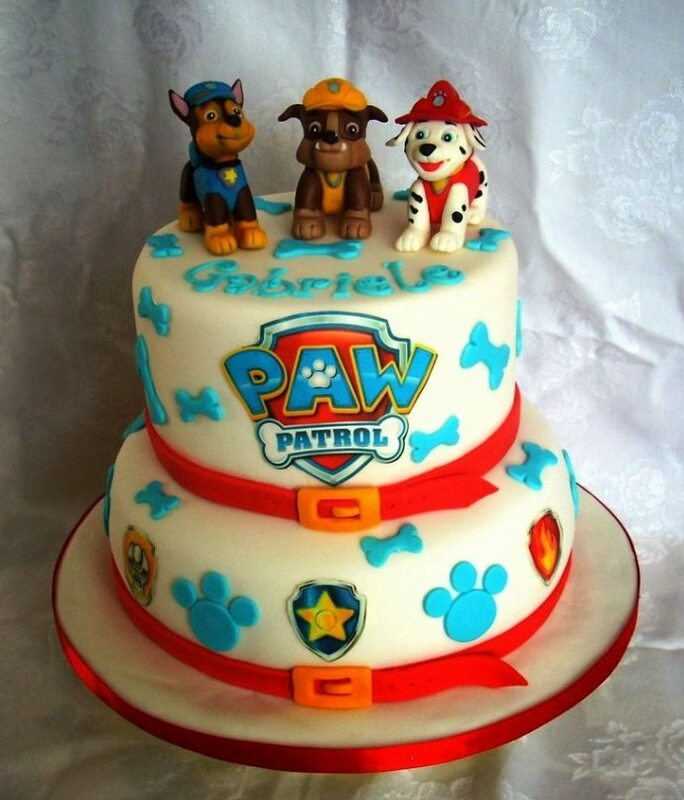 Finish the party with a stunning Paw Patrol cake using character figurines and a fondant topped tiered cake. 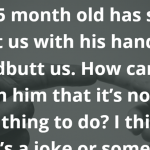 Do your kids watch Paw Patrol? 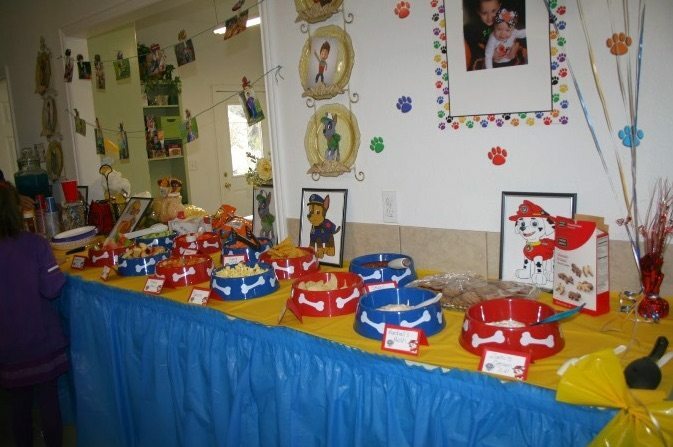 Would they love a Paw Patrol Party?